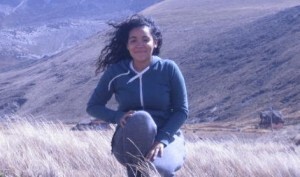 Ashley Sanchez ’14 (Sociology/Black Studies) explores the Andes during her semester abroad in Ecuador thanks to funding from the Benjamin A. Gilman International Scholarship. This academic year, more than 20 SUNY New Paltz students have been awarded federally funded national-level scholarships including Benjamin A. Gilman International Scholarships, Fulbright English Teaching Assistantship (ETA) grants, and, for the first time ever, a Boren Scholarship. “In recent years SUNY New Paltz has emerged as the leading public institution in New York State in regard to the number of Gilman Scholarships awarded to its students,” said Bruce Sillner, dean of international programs. Sillner said 17 New Paltz students received a total of $58,000 in Gilman Scholarships this academic year, and since 2009 nearly 60 students have received approximately $200,000 in funding. According to Sillner, five students have already been awarded Gilman Scholarships for the fall 2014 semester to study abroad in Ghana, Japan, and the United Kingdom. The Gilman Scholarship Program is intended to provide students with the opportunity to gain a better understanding of other cultures, countries, languages, and economies—making them better prepared to assume leadership roles in an increasingly global economy and interdependent world. Scholars are selected from over 8,500 scholarship applications annually and receive up to $5,000 to apply toward their study abroad program costs. One of the main contributing factors to the College’s success with the Gilman Scholarship, said Sillner, is the close collaboration between staff in the Center for International Programs (CIP) and the Education Opportunity Program (EOP). Teobaldo Almonte ’15 (Graphic Design); Stefany Batista ’14 (Psychology/Disaster Studies); Maria Bermary ’14 (Early Childhood); Jonathan Cantres ’15 (History); Austin Cartagena ’15 (International Relations); Wendy Chiu ’15 (Journalism); Brittney Depaola ’15 (Communication Disorders); Ediliana Estrella ’16 (Asian Studies); Gerlynn Germain ’14 9Black Studies); Josh Greenberg ’16 (English/Asian Studies); Amber Murchison ’15 (Black Studies/Art Studio); Jillian Nadiak ’15 (Journalism/Film & Video Studies); Dessiree Pendleton ’15 (Psychology/Disaster Studies); Angela Pujols ’15 Latin American & Caribbean Studies); Ashley Sanchez ’14 (Sociology/Black Studies); Jason Serrano ’15 (Asian Studies/English); Mikuko Shimura (Psychology/Asian Studies); Tara Stephens ’14 (Sociology); Arlenys Valdez ’15 (Asian Studies/ Communication); Laury Veudna ’14 (Black Studies); and Terisa Woych ’15 (Biology). As a result of their undergraduate study abroad experiences as students at SUNY New Paltz, three recent graduates have received Fulbright ETAs to teach English in Mexico and Malaysia. Wendy Cohen ’13 (Spanish/Latin American Studies) studied abroad in Mexico as part of her undergraduate education and returned to Mexico during the 2013-14 academic year to teach English at the University of Chiapas. Class of 2014 graduates Deborah Walnicki (Sociology) and Kelly Case (Adolescent Education/English) are set to follow in Cohen’s footsteps as ETAs in Malaysia starting in January 2015. Valentina Mogollon ’16 (International Relations/French) will study French in Senegal this upcoming academic year thanks to $16,000 in scholarship funding from the Boren Scholarship African Languages Initiative (AFLI). To be awarded a Boren Scholarship, students need to demonstrate an interest in a non-Western language and culture relevant to U.S. national security interests and a commitment to completing a year of U.S. government employment upon graduation.